This tutorial will explain the process of designing and creating an icon from one of my favourite sets of custom icons. This dark, metallic and slightly glossy set was produced for a ‘button-type’ custom icon design to be used in a PDA driven software application. The icons all feature the same ‘button’ background – which is what we will focus on – and have quite simple, slick graphics and symbols over the background. The sample icon used in this tutorial is 60 x 60 pixels, although some of the set was also produced in a 35 x 35 pixel size. Draw a square, 58 x 58 pixels with radius corners using the shape tool. To ensure sharp edges draw the shape viewing at 100% size, or use guides, otherwise the edges will more than likely be blurred due to the fact that the shape will not start on a whole pixel integer. Apply a 1 pixel stroke. I chose a ‘steel grey’ colour for the stroke and filled the shape in black. To add the bottom right corner metallic bevel to the icon background, I duplicated the square shape and removed all effects and set the fill to 0% in the layers panel. A stroke of 4 pixels was added with the position dropdown set to ‘inside’; logically this applies the stroke from the edge of the shape inwards, so that the original 1 pixel stroke is still visible (on another copy of the shape). To achieve the metallic look, choose ‘gradient’ fill type on the stoke properties and use black and a lighter grey than the 1 pixel stroke (in this case, steel grey). Use the angle and scale options of the gradient settings to tweak and suit to taste. Now to add the perforation effect. Firstly, apply a fill colour – I used dark grey – and an inner shadow which is lighter to give the impression of light hitting the ‘lip’ at the bottom of the perforation holes. I’d suggest making just a 1 pixel hard edged shadow (basically as small as possible as the dots themselves are small). Make the perforated artifact layer in a group in the layers panels, then use the original round cornered square to make a mask of the folder – this will ensure that the about-to-be-faded edges of the perforation does not slyly exceed the dimensions of the button. The next step is to use the eraser to delete around the edge of the folder mask to soften the edges of the perforation. Finally, we’re going to add a highlight. Again use the background shape square to make a selection (ctrl+click the shape in layers panel), add a new layer on top of all others and fill white, use the circle selection tool to remove the lower half leaving a nice arc finish. I then use a gradient overlay with varying degrees of transparency but you can use the eraser to remove areas, although I find the former leaves you room for later changes. Voila! Hopefully you’ll have something that looks similar. 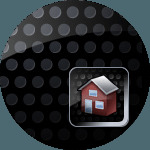 The house icon was produced in Photoshop but could be drawn in almost any graphics software. I drew it larger than required because at the time of development there was potential that it would be used on larger sizes (which incidentally, never materialised). I’m going to give brief steps to this, as really the icon could be anything at all, and I will show some more examples of the final set at the end of this tutorial. Draw the basic shapes: I used the shape polygon tool, so that I had the freedom to tweak angles without having to redraw – you can just move the control points around as you would in vector graphics software. Here you can see five basic shapes: roof top, roof return, front elevation, side elevation and doors and windows as one shape (as they will receive the same effects it saves a little time and effort to make them all on the same shape layer). Next up it’s time to add some colour, strokes and simple gradients. The key here is to keep it simple as final detail added after, such as highlights, will affect the icon as a whole so we will apply them once the basic colouring is complete to a layer that covers the whole icon. The final step is to add finer detail and highlights, such as the edge on the roof, the curved highlight and the highlights on the windows and doors. Finally, here are a few other icons from the set also in the smaller 35 pixel size (see the Icon Scaling tutorial). I still really like these custom icons, even after a couple of years. It’s worth noting that the perforated effect is about at its limit in terms of small size – in fact there were one or two icons in this set that were required at 16 x 16 pixels – these used a steel grey stroke with a plain black button with no perforated pattern. Looking for delicious Custom Icons? Any ideas for an icon to go with my website at http://BoqueteLots.com? We talk about travel, immigration and real estate ideas. Thanks! That is a pretty open ended question but I would be happy to discuss your requirements, if you want to drop me an email.